Iraq’s prime minister has ordered the immediate execution of all death row terror convicts after militant group Islamic State (ISIS) killed eight hostages. Haider al-Abadi said the executions would avenge the deaths of the captives, whose bodies were found next to a highway north of Baghdad on Wednesday, according to Agence France-Presse (AFP). Abadi ordered “the immediate punishment of terrorists condemned to death whose sentences have passed the decisive stage,” the prime minister’s office said. The order relates to all those whose appeal process has been exhausted. AFP cited an Iraqi judicial source who said more than 300 people have been condemned to death for ISIS membership. Iraq’s criminal justice system is creaking under the weight of tens of thousands of detainees as its forces round up remaining ISIS elements and root out suspected sympathizers. Because Iraqi authorities refuse to provide statistics, it is hard to know exactly how many prisoners are being held or executed. Analysis by Associated Press suggests at least 19,000 people have been detained, accused of terrorism offenses. The estimate is based on a spreadsheet of prisoners provided by an anonymous Iraqi official. The real number of prisoners is likely even higher, as many others are being held by military intelligence and Kurdish forces. AP estimated that 3,130 people have been sentenced to death for links to ISIS and other militant links since 2013. 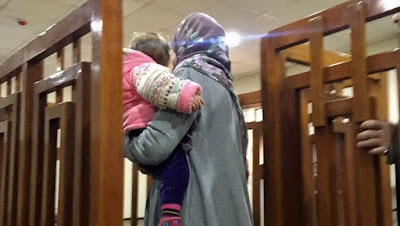 Those sentenced to die include the sister of ISIS leader Abu Bakr al-Baghdadi and around 100 foreign women who traveled to join ISIS’s self-declared caliphate. Thousands of others of prisoners have been handed long jail terms. The government has been accused of heavy-handed sentencing. According to Human Rights Watch, those sentenced to death include includes cooks and people who worked in ISIS-run hospitals. Abadi has previously called for an accelerated rate of executions as Iraqi criminal infrastructure struggles to deal with the huge influx of prisoners. Since 2014, at least 250 hangings have been carried out. One hundred of those took place in in 2017, marking a clear effort to fast-track cases, AP said. Iraqi authorities began executing convicts on Thursday, with at least 12 people killed. The executions were announced via a message posted to Abadi's Facebook page. ISIS released a video on Saturday showing six captured police officers and members of the Hashed al-Shaabi paramilitary force. The militants said they would kill the hostages unless Iraqi authorities released Sunni Muslim women held in its prisons within three days. Abadi suggested the hostages were likely already dead when the video was released. Their bodies were among the eight found decomposing and strapped with explosive vests in Tel Sharaf in Iraq’s Salaheddin province on Wednesday. “Our security and military forces will take forceful revenge against these terrorist cells,” Abadi said. “We promise that we will kill or arrest those who committed this crime. This article has been updated to include the fact that executions have begun.